According to VN Research, annual growth rate of Vietnam’s Food industry was estimated at 11 per cent during the 2015 - 2020 period. In 2017, Food industry accounted for 15% GDP, of which food and beverage consumption increased at respectedly 9.7% and 6.7% per annum. For many years, Vietnam has remained as one of the world leading exporters of rice, cashew nut and coffee. For the 1H of 2018, export value of agri-aquacultural products has reached USD13.45 billion, an increase of 9.5% compared to the same period of 2017. Of which, fruits and vegetables export increased by 21% to reach USD2 billion, and seafood export witnessed a prospected growth of 11%. Vietnamese agricultural products has been exported to over 100 countries over the world. 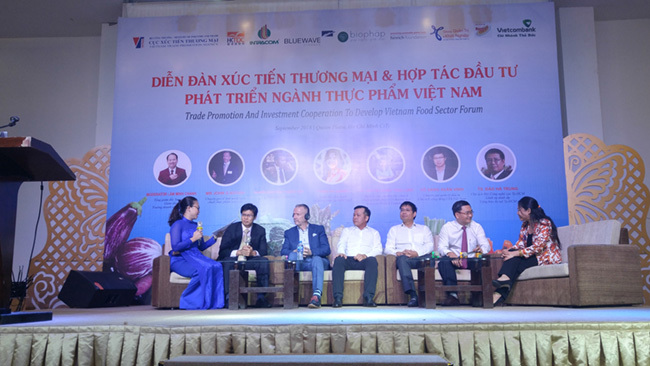 The speakers pointed out that in prior to funds raising or anything else, Vietnam food businesses need to produce clean products, and then one way or the others, proving and showing the traceability of their transparent production processes. The most discussed subject for the traceability system is the blockchain technology. However, according to Mr. John G. Keogh, expert on the global food chain transparency, blockchain is not the only technology that can be used to create traceability system, it is just the most optimal approach. "There are so many ways to demonstrate their products are safe and blockchain is not the only option. It is not necessarily for all businesses to apply blockchain. This technology is optimal when the size of an enterprise is relatively large with strong financial capability and a specific medium-to-long-term business plan. Before deciding of what technology to be used, you must know what you have and what you really need", said John. Mr. Vo Xuan Vinh, investment management specialist - President of the Vietnam CFA Community, added that, every food enterprise should prepare a careful business plan to really make things work. "Without a specific 5-year business plan, it is difficult for businesses to attract investors. Therefore, the owners need to prepare a business financial model to first tell the story about their businesses. And then, the model and the business plan must be continuously adjusted to the real-life situations so it can stay logical and practical. To create such plan, small and medium enterprises (SME) need to understand where the company is in their business cycle", said Vinh. In addition, enterprises who bring high added value to their products tend to attract more investors. Businesses who control the complete inputs and outputs of the production chain, from farm cultivation and husbandry to food processing and product distributing, will be highly likely to receive a much substantial investment than the others. However, the fact is that not all SMEs in the food industry in Vietnam having capability to do both production and financial planning efficiently. Generally, to bring added value to their products and influence the value in the eyes of investors, enterprises need to do have long-term strategies along with the commitment on clean production and the application of traceability technology. On the same occasion, Bluewave Advisory also had a chance to introduce about the establishment of the Vietnam Food Integrity Centre (VFIC) as well as our new services. VFIC will operate as a non-profit collaboration and facilitation center focusing on assisting domestic food companies as well as becoming a trustful bridge for organisations and corporations searching for opportunities in this prospected industry in Vietnam. To domestic food companies, VFIC aims to provide customised service package (from market research, product design, global food safety regulations update, laboratory analytical to business plan, capacity building, financing and funds raising). The ultimate goal is to help these businesses sketch out the most practical medium-to-long-term strategy. Furthermore, this centre also sets the mission to be an information portal for oversea organisations and businesses to verify the quality of products sourced from Vietnam. In this project, Bluewave will partner with VFIC as the financial and strategic advisory. Starting from this year, we are providing a new advisory service which is financial and business planning. This service aims to assist companies who are at pre-IPO and/or equity expanding stages to form a strategic business plan with detailed and practical financial projections. Mr. John G. Keogh will be the chairman and CEO of the VFIC with the supports from Bluewave. The official launch date of the centre is set out in this Octorber.